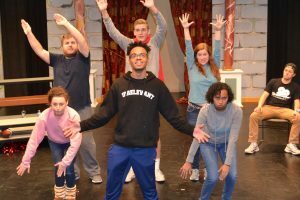 Showcasing its breadth of talent, Asbury University’s Theatre & Cinema Performance program will perform the Tony Award-winning musical “The 25th Annual Putnam County Spelling Bee” this month. The show brings much excitement to campus as it marks the first musical theatre performance by Asbury’s Theatre & Cinema Performance program in six years. Performances will be in the Greathouse Theatre in the Miller Communication Arts Building on Nov. 8-9 and Nov. 15-17 at 7:30 p.m. A matinee performance will also be offered on Nov. 10 at 2 p.m. Tickets are available for purchase online and at the Greathouse Theatre box office. Directed by Professor Carol Anderson, the musical follows six oddball characters, all participants in the namesake spelling bee and each with a distinct story behind their desire to win. The spellers each deal with various degrees of success and failure along the way. The production has presented unique opportunities for the student cast and crew, as well. In addition to honing their craft in classes and workshops, Theatre students are given agency to grow through professional development onstage. Students participating in the production of “Putnam” have found that the show has also been an impetus of community-building and is a testament to the quality of the department. “[I have] really enjoyed working with the cast and crew, and it has been great to just grow together with them,” said James Southworth ’19, who plays one of the six spellers. Nate Thomas ’22, excited to participate in his first Asbury production, has appreciated the relationships developed among cast members. The show is also evidence of just how far the Asbury community stretches, with alumna Kristin Gillis ’10 Jones serving as musical director. “The music is complex and she has just made it work,” Anderson said. Anderson said that there will be a fair portion of audience participation and encourages those coming to the show to “go along with the insanity,” but most importantly, she just wants the audience to laugh and enjoy themselves. Learn more about Asbury’s Theatre & Cinema Performance major.